including Neoseiulus fallacis, are effective and widely distributed natural enemies of spider mite pests of strawberry. The two spotted spider mite (Tetranychus urticae) can be a major threat to yields in susceptible cultivars such as Totem. These guidelines are for using predator mites to control spider mites in strawberry. These guidelines cover identification, life cycle, sampling, release guidelines, how to obtain and handle predators, and pesticide compatibility with these natural biological control agents. These recommendations reflect over four years of research and implementation field trials conducted in Western Oregon strawberry. No claims are made as to the appropriateness of any recommendations herein for regions elsewhere. These guidelines may apply to some extent, however, in regions of similar climate, such as Western Washington and British Columbia. Also, it has not yet proven whether N. fallacis can provide biological control of Cyclamen mites. While preliminary tests have shown that N. fallacis will eat Cyclamen mites, it is unknown at this time whether it can travel inside the budding leaves where Cyclamen mites are found. 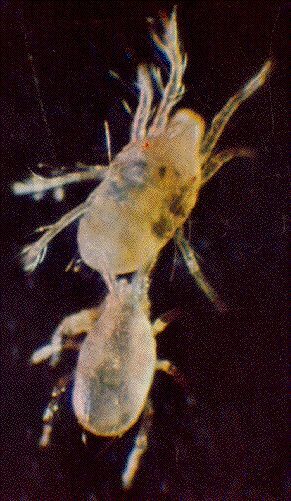 Neoseiulus (Amblyseius) fallacis (Garman) is a predator mite of the family Phytoseiidae. 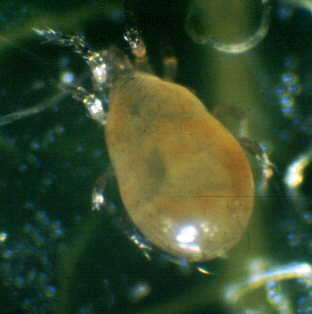 These mites are very small in size (0.25 to 0.5 mm), and are somewhat similar in appearance to the twospotted spider mite, but are more flattened and lack spots (Figs. 1, 2 and 5). 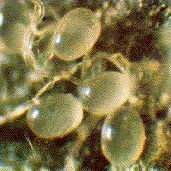 Phytoseiids pass through the same developmental stages as do spider mites (eggs, larvae, protonymphs, deutonymphs, and adults). Eggs of N. fallacis are nearly transparent white, shiny, and football-shaped (Fig. 3). Compare these to two-spotted spider mite eggs, which are rounder, and usually associated with the webbing produced by spider mites (Fig. 4). 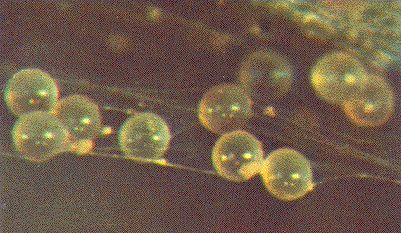 N. fallacis eggs hatch into a larval stage that have six legs. They then pass through the nymphal stages before becoming adults, which have eight legs. N. fallacis adults are somewhat shiny, tan to slightly orange in color, and are pear-shaped (Fig. 5). Figs 1-5 (left to right). There is a third type of leaf-inhabiting mite in strawberry that is sometimes confused with N. fallacis, the Tydaeid mite. These are not considered pests normally but they are not beneficial, either. They have a different color, shape, and behavior from either the pest or predator mites (photo not available). They are not marked and are dull-colored (not shiny), are smaller in size, have long front legs that are continually active rather like antennae, and they are very active but usually do not travel far, and almost act as if they are nervous. The life cycle of predator mites is somewhat shorter than plant-feeding mites. N. fallacis, is very common in strawberry fields. They overwinter in dead leaves, on stems, and on green foliage. The developmental threshold of N. fallacis is near 50°F (10°C), versus the cooler threshold of the twospotted mite, which is around 47°F (8.3°C). At 70°F (21°C), N. fallacis eggs hatch in 2 days, and adults develop in 7 days. At 55°F, adults develop in 16 days. Female predator mites each produce 30 to 60 eggs, which is generally equivalent to the number produced by their prey. This high rate of reproduction, plus a very high preference for spider mites help account for the effectiveness of N. fallacis. N. fallacis is known in particular for its affinity for humid environments such as in peppermint, strawberry, and sweet corn where the dense plant canopy sustains a high humidity. In determining need for controls, it is essential that predator mites be recognized and counted along with injurious mites when sampling strawberry leaves. The ratio of predator mites to plant-feeding mites and the population trends are very useful for determining whether or not expected injury justifies application of controls, whether chemical or biological. Unnecessary treatment with non-selective chemicals will reduce predator mite populations, which could result in a rapid buildup of injurious plant-feeding mites. Populations should be sampled at least once before predator releases are made, and at least every 3-4 weeks thereafter (more often during critical treatment decision periods, less often during cool seasons). The only requirement for sampling is to have 3x or higher magnification. Hand-lenses, A sample may consist of at least 1 site per acre, at least 10 sites per field. A site may be several steps in circumference. Sample 6 trifoliate (whole) leaves per site, taking leaves from parts of the plant where spider mites are expected to occur (i.e., avoid sampling very young or very old leaves). Search leaf undersides for the presence/absence of predators, and count the total number of spider mites by 5s or 10s (0, 5, 10, 15, 20, 30, 40, etc.). For spider mites, count a cluster of 5-20 eggs as 1 adult, and count a cluster of 5-10 immatures as 1 adult. For predators, count all adults, male and female, and larger nymphs. Training may be required in order to find and recognize predator mites. Since HIGH populations of predator mites occur at only about 1 predator for every 10 2-spot spider mites (1:10 predator:prey ratio), they can be very difficult to find because relatively few are needed to provide biological control. If you count predators based on their presence/absence, you may convert these counts to absolute density estimates using Table 1 below. Examination of each leaf should take about 20-30 seconds for trained observers. At each site, record for each of the six leaves, the number of spider mites, and the presence or absence of predator mites. See our example short sampling form and longer sampling form (printable; may not work with all browsers) for the recording of sample data. Draw a map of the field and record the location of each sample site for determining and tracking "hot spots" in the field. You may want to release higher densities of predators or use selective acaricides in these "hot spot" areas of the field. You may want to confirm the identity of your predator mites with the help of a specialist. Several consultants and Extension Entomologists can at least confirm whether you have predators in the mite family Phytoseiidae to which N. fallacis belongs. Identification to species will require more effort by facilities such as the Oregon State University Extension Entomology Insect ID Service (phone no. 541-737-5520). You can collect predators by saving up to 10 leaves that harbor them and storing under refrigeration (for a few days only) until delivery to a qualified identification specialist can be made. Table 1. Conversion of predator presence/absence counts to an absolute estimate (N = 190 samples of 10 leaves). For example, if 45 out of 90 leaves were found to have predators present (50%), the overall average density would be about 0.95 or 1.0 per leaf. Note that these samples were taken in the field using 3X magnification; predators were missed that might have been detected in a more thorough search in the laboratory using a dissecting scope. N. fallacis will provide excellent natural biological control of twospotted spider mites, if populations are conserved. When populations are disrupted due to incompatible pesticides, recolonization usually occurs from surrounding habitats. In addition, this species may be re-introduced manually. Several insectaries and biological control supply houses carry N. fallacis. Released predators will spread throughout the field over several weeks to months, depending on the number released, weather conditions, the condition of the foliage, . Preliminary release recommendations are based on recent work with N. fallacis on strawberry and peppermint. Croft and Coop (1997) developed a model of how fast they disperse in strawberry in relation to degree-day (DD) accumulations. This model has been implemented as the predator mite release calculator (MITECALC), and the static information presented below is based on the calculator version of the model. We recommend you read all guidelines and then use the calculator to design a release program specific to your needs and field conditions. The number to release depends in part upon whether more or less rapid control is desired. More-rapid control (3-5 weeks, longer for high spider mite infestations) can be expected with relatively high (innundative) release rates, about 7,000-12,000 predators per acre. The cost of these releases should be roughly equal to about 2 applications of conventional miticides. Less-rapid control (within 2-4 months, longer if releases are made in cooler months) can be expected with low to very low (inoculative) release rates, about 500-1,500 predators per acre. This approach takes advantage of the predators' high natural reproductive and dispersal abilities. The actual release rate depends on the density of 2-spot mites, the density of foliage in the field, the time of year, and the period of time allowable before control is desired. If available, predators may be taken from fields where spider mite populations have crashed and predators remain abundant, or when predator:prey ratios are 1:10 or better. Miticides including omite and vendex (both at lower rates) are compatible with predator mite releases and may be necessary to provide control while predator populations build up (see below for other pesticide compatibility). This program was developed for estimating the number of N. fallacis to release in strawberry for the long-term control of Twospotted spider mites in Western Oregon. Releases include healthy populations of adult and immature N. fallacis; only adults and older immatures (known as deutonymphs) are counted for the release rate however. Weather data used in the MITECALC model are 20 year average from Corvallis, Oregon. Predator movement will be slower or faster depending on the season and the climate of the particular location. Releases are shown to be evenly distributed: practical release strategies should place more predators wherever higher spider mites densities occur. Be sure to follow directions supplied by the producer or distributor of the predator mites. These guidelines are very general and may not apply to the specific product you are dealing with. Because the actual number of predators can vary among shipments and individual containers, a verification sample is helpful to assure viability and quality. To take a verification sample: 1) Gently and thoroughly mix each shipment container and scoop out about 15 ml (if on vermiculite) and place in a vial with an air-tight seal; or place in a larger bottle with 70-90% alcohol, 2) Send the samples to a qualified expert to verify the species (or at least that they are in family Phytoseiidae) and the density per sample. Also, check the samples yourself. Reread notes on identification given above. The predators should be moving up the sides and on the lid of the container. Check for good, healthy female adults, which are easy to recognize from their robust, shiny appearance and very active search behavior. Small, dull-colored and sluggish females are not as likely to survive. Watch for 2-spotted (prey) mites, which are OK if present in the small numbers. Note that predator mites will not survive storage, except perhaps for a few days under refrigeration (best between 45° and 52° F). Avoid making releases when temperatures are very high (80+°F) and humidities are low, since A. fallacis is especially sensitive to dry conditions. If predators arrive on vermiculite, it may be easiest to dilute 1,000 predators with extra vermiculite so that a standard 1/4 cup equals the 12 mites per site. Be sure to mix the predators gently and uniformly throughout the vermiculite. Do not try to dilute if predators arrive on leaves. For best results, apply the predators to the crop as soon as possible after receiving shipments. Make sure the predators make contact with the plant foliage (whether the carrier is vermiculite or bean plants). In general, space release sites evenly throughout the field, especially towards the upwind side and wherever spider mite densities are highest. If possible, scout the field and map spider mite hotspots just before or during predator releases. Apply predators more heavily wherever spider mite densities are high; apply fewer predators where spider mites are less dense. Predators will build up slightly faster wherever spider mite eggs are abundant. Predators will move more quickly wherever spider mites are sparse. If you are making a release for the first time and you wish to be certain that they have survived after a short or long period, you may want to set out one or more marked release sites. To do this, find sites that have a sufficient population of spider mites to serve as food (0.5 or more per leaf are recommended). Then, release at least 50 predator adults and large nymphs at those sites. Next, mark the site(s) with a flag or similar marker so that you can sample immediately around them after 1 week, 2 weeks, 1 month, or sometime in the early spring (to determine if they have overwintered successfully). If you can find predators at these sites, then you can be fairly certain that they are surviving throughout the field. This method can also be used to save time in sampling the field while predator populations have not had sufficient heat units to easily be found throughout the remainder of the field. Remember that these predators are living and must be fed almost constantly to remain alive and healthy. It is vital to apply them to the crop as soon as possible, and that they should be shipped over short distances if possible, and kept away from extreme heat and direct sunlight. Cost of N. fallacis will vary depending on the producer, the distributor, shipping method, whether or not predators are pyrethroid-resistant, whether trials are experimental (and subject to discounts), and quantity purchased. Prices will vary from about $9-22 per 1000 predators. The quality may tend to be better at sources charging the higher rates, so do not shop by price alone. Table 2 lists pesticides that collective experience has indicated to have no to very low, moderate, and highly toxic effects against N. fallacis. This table is undergoing continuous development, so please let us know if you can help us improve this information. Also note that strains of N. fallacis are available that are claimed to be pyrethroid-resistant, but we have not as yet seen field tests to verify usefulness of this trait at this time. Note that many of these pesticides are not registered in strawberry - the Pacific Northwest Pest Control Handbooks and pesticide labels should always be consulted to check the registration status of all pesticides used in any given crop. This information is derived in part from a collaboration of works (under development) by P. D. Pratt, G. Koskela, M. Morris, J. Takeyasu, and B. A. Croft. Heavy (double) flaming of the field will reduce predator densities to near zero, while single flaming usually allows sufficient numbers to survive, so that re-introduction may not be needed. Single flaming may adversely affect predator/prey ratios, however, that can lead to spider mite population flare-ups. Applied Bionomics. 1993. Pesticide resistant spider mite predatory mite (Amblyseius fallacis). Unpublished release guidelines. Applied Bio-nomics LTD. Sidney, British Columbia. 2 pp. Coop, L. B. and B. A. Croft. 1995. Neoseiulus fallacis: dispersal and biological control of Tetranychus urticae following minimal inoculations into a strawberry field. Exp. and Appl. Acarology 19:31-43. Croft, B. A., and L. B. Coop. 1997. Effects of heat units, release rate, prey density, and plant age on dispersal by Neoseiulus fallacis (Acari: Phytoseiidae) after inoculation into strawberry. J. Econ. Entomol. (in press). Henderson, D. 1993. Update on using biologicals in small fruit in 1992. Unpublished report. E. S. Cropconsult Ltd. p. 27. Hadam, J.J., M.T. AliNiazee, and B.A. Croft. 1986. 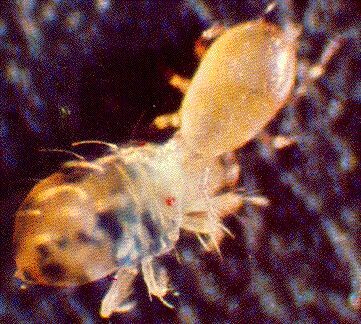 Phytoseiid Mites (Parasitiformes: Phytoseiidae) of Major Crops in Willamette Valley, Oregon, and Pesticide Resistance in Typhlodromus pyri Scheuten. Environ. Entomol. 15: 1255-1263. Morris, M. 1992-4. The biology of the predator mite, Neoseiulus fallacis, and management of the twospotted spider mite on mint. OSU Entomology PhD research - Research Progress Reports presented to the Oregon Mint Growers, 1992, 1993, 1994. Raworth, D.A. 1990. Predators associated with the twospotted spider mite, Tetranychus urticae, on strawberry at Abbotsford, B.C., and development of non-chemical mite control. J. Entomol. Soc. Brit. Columbia 87, December, 1990.